International train services are being cut at a station in east Kent which opened 10 years ago at a cost of £80m. Ashford International Station will lose all Brussels trains and its off-peak Paris services when the new £100m Ebbsfleet station opens next October. 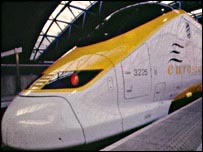 Eurostar said Ashford would retain some peak daily services to Paris and weekly trains to France, while also running high-speed domestic services from 2009. 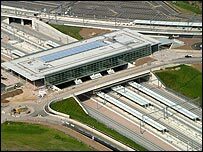 Ebbsfleet International Station, in north Kent, was unveiled on Tuesday. Eurostar said the new station would mean a "big increase in the number of trains serving Kent". Situated close to the M25 between Dartford and Gravesend, it will offer "easy access to continental Europe for more than 10 million potential travellers across southern England". Eurostar said many passengers currently using Ashford International Station would prefer to take advantage of Ebbsfleet's location. But that means changes to the timetable for Ashford. Eurostar services began running from the town's purpose-built international station in January 1996, using an existing railway track from London Waterloo. It was later that year when the route for the high-speed Channel Tunnel Rail Link was agreed - London St Pancras, via Ebbsfleet and Ashford, to the continent. "We knew once the route was decided on and we moved towards it that we would have to look at our stopping patterns for the intermediate stations," a Eurostar spokesman said. But he denied next year's transfer of services to Ebbsfleet would signal the end for Ashford International. "The Ashford station will remain there, it's still part of the Eurostar network but it will sit alongside Ebbsfleet," the spokesman insisted. Ashford MP Damian Green said he wondered "whether Eurostar have got their projections right" in prioritising services from Ebbsfleet. "It's obviously very worrying and disappointing," he said. "Given the expansion of Ashford and the emphasis the government has put on Ashford as a centre of development in east Kent, to say there are going to be no direct services to Brussels seems to fly in the face of that policy." Trains will begin operating from Ebbsfleet when Eurostar moves its London base from Waterloo to St Pancras in October 2007.